I’ve wanted to make chocolate pasta for quite some time now and when I saw this month’s We Should Cocoa challenge on Blue Kitchen Bakes I decided this was the weekend to get it done. There was a bit of trepidation with the pasta component as I didn’t know how well it would roll through my pasta maker. This aspect of the dish was easy and I will definitely make the pasta again. I chose to make the sauce quite tart but Dave said that the acidic aspect of it overwhelmed the pasta. I quite liked it, but then I don’t have an overtly sweet tooth given that I have very little sugar in my diet. The first thing one has to get used to is the sweet pasta. One expects pasta to be a savoury dish. Because of this expectation I mimicked pasta with a tomato sauce, garnished with fresh basil and grated Parmesan cheese. This dessert needs to go from stove to bowl to tummy quite quickly, which is something I could not achieve with plating and photographing. It is an interesting combination of flavours heightened by the ginger in the sauce. I won’t be making this recipe again, but I have another recipe written in my book to try soon. have you ever had chocolate pasta? What a fun recipe. I do enjoy trying out these slightly left of centre recipes. I made chocolate pancakes with blackcurrents today and the subtle flavourings I added to the pancakes were completely lost by the blackcurrents. They were very nice though as I’m sure your pasta was. Thanks for joining in with We Should Cocoa. Sorry ignore that email copy and pasted wrong! I hope you make it! Chocolate pasta sounds so interesting. It is hard to imagine pasta as a dessert dish. But, I bet it could have potential. I’m hoping there is some potential! 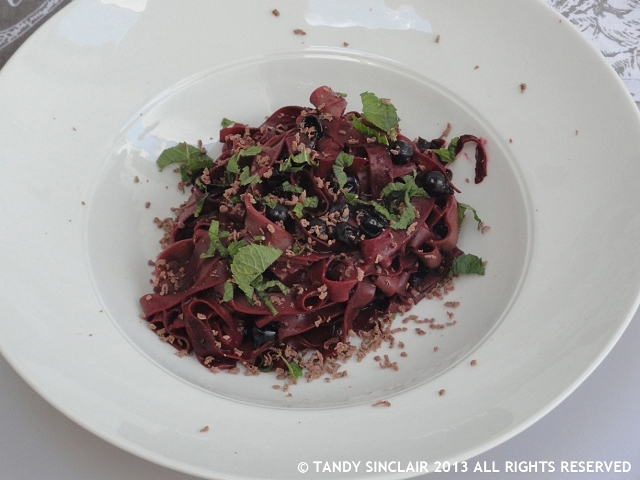 What a fantastic & amazing special cacao pasta recipe! So well flavoured too, dear Tandy! I want a big spoonful right now! Wish I could send you some! Hmm, not sure if I would enjoy this, but can’t say until I have tasted it. Not worth trying if you are not convinced!